Year-to-date, through end of December 2017, Smart Beta ETFs and ETPs listed globally saw net inflows of $71.75 Bn. 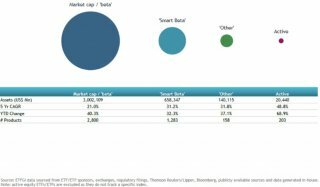 Assets in market cap ETFs increased by 40.3% in 2017 which is significantly more than the 32.3% increase in Smart Beta assets. According to ETFGI’s December 2017 Global Smart Beta ETF and ETP industry insights report, an annual paid-for research subscription service, assets invested in Smart Beta ETFs/ETPs listed globally grew by a record US$160.61 Bn during 2017, almost double the previous record of US$87.41 Bn set in 2016. The increase of 32.3%, from US$497.74 Bn at the end of 2016, also represents the greatest growth in assets since 2009 when markets recovered following the 2008 financial crisis. This record was achieved on the eve of another milestone for the ETF industry: the 25th anniversary of the listing of the first ETF in the US, the venerable SPDR S&P 500 ETF (SPY US), on 22nd January 1993. At the end of 2017, SPY on its own accounted for assets of US$271.39 Bn. December 2017 marked the 23rd consecutive month of net inflows into Smart Beta ETFs/ETPs listed globally, with US$8.45 Bn gathered during the month. During 2017 Smart Beta ETFs/ETPs listed globally saw net inflows of US$71.75 Bn; 33.2% more than net inflows for 2016. 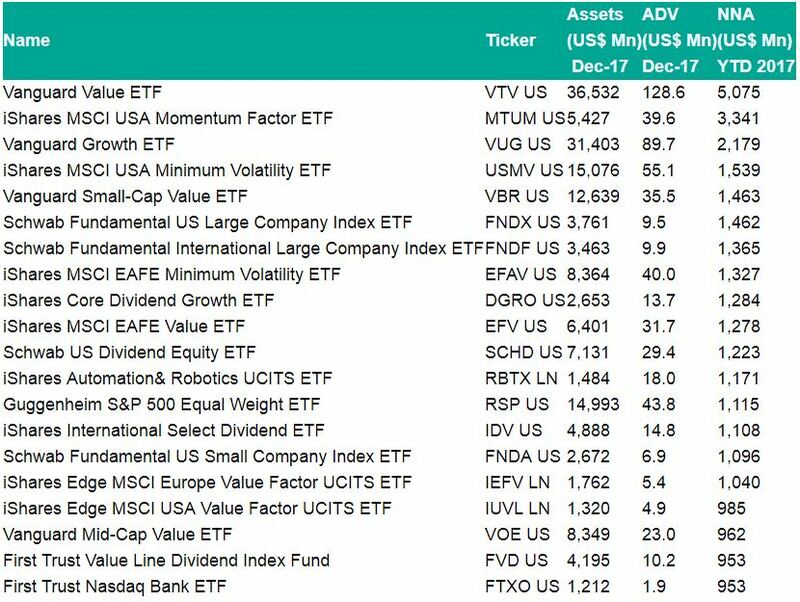 The majority of these flows can be attributed to the top 20 Smart Beta ETFs by net new assets, which collectively gathered US$30.92 Bn during 2017. The Vanguard Value ETF (VTV US) on its own accounted for net inflows of US$5.08 Bn. Similarly, the top 10 ETPs by net new assets collectively gathered US$661.56 Mn year-to-date during 2017. Value Factor ETFs/ETPs listed globally saw net inflows of US$2.63 Bn in December, growing net inflows for 2017 to US$16.66 Bn. Multi Factor ETFs and ETPs gathered net inflows of US$1.41 Bn in December, bringing net inflows for 2017 to US$12.85 Bn. 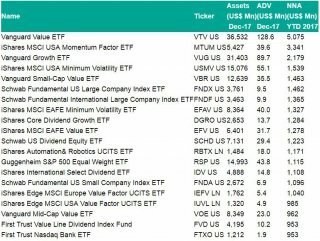 To conclude, investors have tended to invest in lower cost and Value Factor ETFs in 2017 with the Vanguard Value ETF (VTV US) accumulating net inflows of US$1.40 Bn and a TER of 6bp.